As police officers and firefighters marched into the Cathedral of Christ the Light in Oakland last Thursday morning, the navy gabardine of their dress forming a dense block of color in the front pews, the name of this annual event, replicated in Catholic communities all across the United States, seemed more apt than ever: The Blue Mass. Despite—or perhaps because of—the grey and chilly morning, the officers, their families and local dignitaries filed briskly into the cathedral and gathered at the front. Bishop Michael Barber filled the air with sweet-smelling smoke from a censer. A musician seated at the enormous organ that dominates the front of the cathedral struck up the national anthem, and as the congregation sang even the two babies in attendance, who otherwise kept up a steady, quiet stream of burble throughout the ceremony, fell quiet. Outside, two fire trucks were stationed on Harrison Street, overlooking the lake. Extended ladders supported an American flag, which flapped in the autumnal breeze. Below, two other flags hung from the truck; the green and gold of the Oakland A’s and the black, white and grey of the Raiders. Police officers, firefighters, emergency medical officers, and law enforcement personnel of all types are honored at a Blue Mass, during which community members and faith leaders can offer thanks to the men and women responsible for public safety and remember those who have lost their lives in the line of duty. “It’s extremely important that our local police officers and public servants and firefighters establish our relationships with faith-based communities because it helps us out in so many different ways,” said Oakland Police Department spokesperson Officer Frank Bonifacio, who was wearing his dress uniform to mark the occasion, at the lunch following the mass. During the memorial section of the mass, a piper dressed in green and orange tartan played “Amazing Grace,” and Detective Sergeant Tom Smith Jr was honored by the reader. Smith, a BART police sergeant who spent 23 years on the force, died in the line of duty in January 2014. He was killed during an apartment search, after another officer mistook him for an intruder and shot him: a single round passed through a small gap in his bulletproof vest. Reverend James V Matthews, the chaplain to the Oakland Fire Department, said that Blue Masses across the country vary in popularity. At the first-ever Blue Mass, in 1934 in Washington D.C., over 1,000 officers attended. And at the event held yearly in New York City, the 2,200 capacity St Patrick’s Cathedral is standing-room-only, he said. 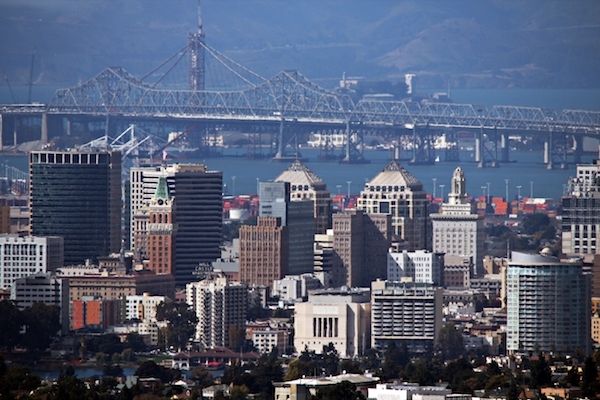 Organizers of this year’s event in Oakland estimated that it would draw about 250 attendees. Matthews was responsible, together with Father Jayson Landeza, the police chaplain, for organizing the event. Chaplains work with law enforcement and emergency services to support officers and to provide a unique kind of ministry. Bishop Barber has served as a naval chaplain for many years, including stints as the Group Chaplain for the Marine Aircraft Group and Deputy Force Chaplain for Reserve Affairs for Marine Forces Pacific. There are about 14 chaplains in Oakland, said Reverend Rufus Robbins, a minister who is also attached to the police department. Police officers exit after the Blue Mass at the Cathedral of Christ the Light on October 9, 2014.